You Guys Make My Day, Too. The Saddle Shoulder Aran Vest is coming along so nicely. All the cabley bits are done, the steeks crocheted and cut, and the bottom band has been knit 1.5 times. Despite going down two needle sizes, it still flared. I’ve gone down 2 needle sizes and decreased 10% for this second attempt. It looks good, I think, but I won’t know until it’s off the needles. I’ve been taking lots of photos of the process of this vest that haven’t been blogged here. Take a gander over at Flickr if it interests you. I took some of one of the steeks. I know I’ve been slow with this, but thanks so much to everyone whose day I make. Same to you! I am awful at these types of posts, so will just share a few knitting links that I love with you. Fluffbuff. I mean, seriously. Francesca’s knitting is outstanding. I discovered her blog, I think, looking for photos of Na Craga (this particular one of hers is perfection) and bookmarked her lickety-split. yarnbee. Cheryl’s sense of color is fantastic! Her photos are great, and doesn’t the whole blog just make you smile? click clack– I can’t read it, but it sure makes me happy to look! isihi’s knitting diary– Crazypants. In a good way. 101 Cookbooks– Make the frozen yogurt. I sure do! It’s good with honey replacing the sugar, as well. Apologies to all who couldn’t access the blog last night and many thanks to those who let me know. I guess the site got too big for its britches (or there wasn’t enough memory alloted for PHP). There was the usual moment of panic, followed by the urge to contact my host, followed by the realization that I could be a big girl and look it up. Fixing it took 10 seconds. Go, me. I love the pictures on isihi’s knitting diary. Do you have any tricks to read her blog? Oh, dear! Thank you for that crazypants-indeed link to Ishi. I will be visiting often. Also, Yarnbee! She looks so cute in her Tangled Yoke. But more important, Wow! You geeked out and fixed yer own website! Man, it’s awesome when moments of panic are followed by the realization that you can find the answer for your own self, innit? I admire your can-do-ness. 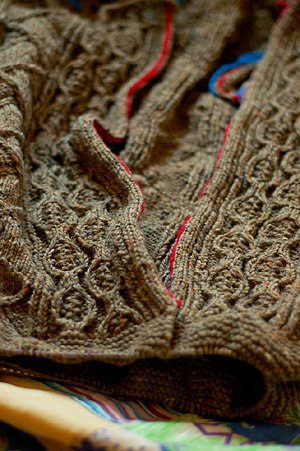 I’m so excited to see how the vest is turning out…I really enjoyed the set of pictures of the steek process on flickr. Pooey, I just realized that I’ll be in class when the shop update with all the mittens happens! C’est la vie, I suppose…there’ll always be another update, and in the meantime I can vicariously enjoy everyone’s mittens via Ravelry. That vest looks beautiful. I look forward to seeing the rest of it. Thanks for sharing fav blogs with us. I loved all of them. If you right click on a block of text, select Page Info, and then choose Translate to English your computer should auto translate the page. It will not get all of the text, but enough so you can get the gist of it. The yarn you used for the vest is so great! It really brings out the cabley goodness! Yay for technically savvy girls! Three cheers for Mr. HelloYarn! I have my own Yarn Assistant, but there’s no way I could persuade him to wind down a bunch of bitty skeins. yay! new blogs to read – thanks for the sugguestion. Looking forward to the fiddlehead mittens! The aran shoulder vest looks STUNNING. I’ve been enjoying following it’s progress on flickr, too. How beautiful, Adrian!!! I’ve been mulling over that sweater myself. Tell me, when you tack down your steeks on the underside of the garment, do you reinforce them at all or just tack them down? followed every bit of advice on the button band. no flare. but the neck looks like it was designed for an elephant. so i think i have frogged 2 and a half times now. this sweater is going to be called murphy’s cardi as it seems that everything that could go wrong, went wrong. and maybe that is an okay name for a sweater with irish inspiration.